Make your Christmas shopping that little bit easier, and think how much petrol you’re saving! Place your orders for meat, bread, milk, dairy produce, groceries, wine and newspapers with your friendly Cottingham and Middleton Community Shop. You’ll also be helping us to continue to serve our community. If you’re getting ready for Christmas, our home made Christmas puddings are full of dried fruit and brandy and come with or without nuts – your choice! 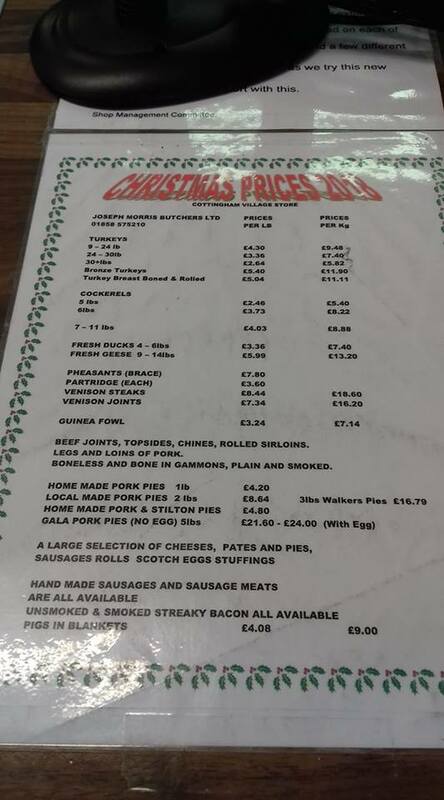 Order your fresh Joseph Morris turkey, cockerel, goose, duck, pheasant, grouse, guinea fowl, other meats and festive favourites including gammon, pigs in blankets and pork pies. View price list. The last day turkey orders is Sun 16 Dec, for delivery to the shop on Fri 21 Dec.
We’ve got a range of wines and Warner Edwards Gin in stock at very competitive prices. The small 20cl bottles make perfect Christmas presents and you can choose from Victoria’s Rhubarb Gin (£16), Elderflower, Harrington Sloe or Harrington Dry Gin, all at £15 a bottle. We also have 70cl bottles of Dry Gin at £33 and Rhubarb Gin at £38. If you’re looking forward to putting your feet up in front of the box over the festive period, you can place orders for full holiday TV guides up until Wed 19 Dec.
We’re now stocking french sticks, rolls and breads from Kings Cliffe Bakery and you can place orders on Mondays, Wednesdays. Fridays and Saturdays. You can also order Hambleton’s bread and cakes. The last Hambletons order before Christmas will be noon on Fri 21 December, and the regular Tuesday delivery to the shop will instead be on Mon 24 Dec. And if you want to order in any groceries before Christmas, please let us know by noon on Tue 18 Dec.
A very happy Christmas and New Year and thank you all for your continuing support over the last few difficult months.